Collision Of Neutron Stars Ushers In New Era For Astronomy : 13.7: Cosmos And Culture Astronomy is forever changed by the viewing of the collision of neutron stars; we can now watch these processes in many different ways as they run their course, says astrophysicist Marcelo Gleiser. 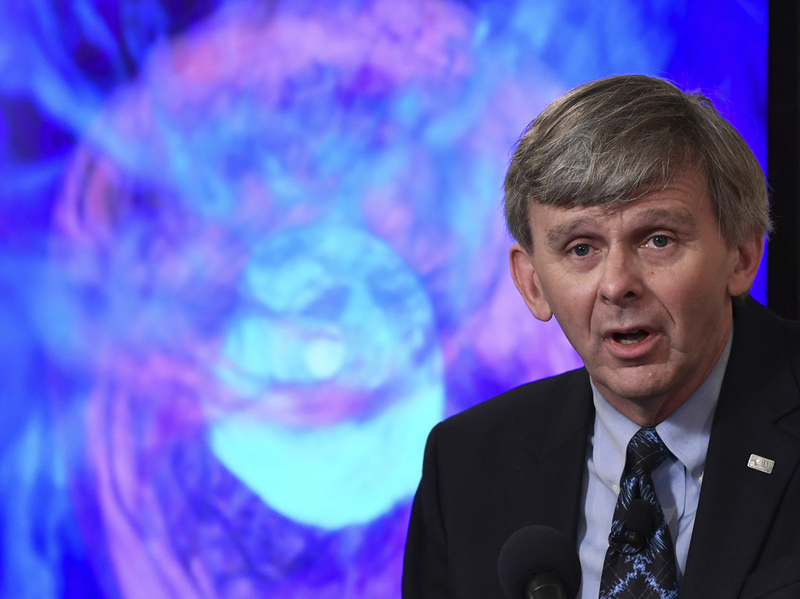 David Reitze of the California Institute of Technology and the executive director of the Laser Interferometer Gravitational-Wave Observatory, or LIGO, speaks at the National Press Club in Washington on Oct. 16. He talks of one of the most violent events in the cosmos, the collision of neuron stars, that was witnessed completely for the first time in August. Some 130 million years ago, when dinosaurs roamed Earth, two dead stars in a far-away galaxy collided violently, after spiraling around each other for millions of years. The dead stars were neutron stars, exotic objects the size of Mount Everest and with the mass of the sun. Being this small and dense, the gravitational force is fierce. Someone once compared the pull of gravity near the surface of a neutron star to having all the population of Paris tied to your feet. The collision was so intense that even space itself waved, simultaneously giving off huge amounts of electromagnetic radiation into the surrounding area. (You can watch an animation video here.) Waves of space, gravitational waves, have been a familiar topic for us in the past few weeks. There were detections of huge black holes colliding, Nobel prizes won, and now this, the simultaneous detection on Earth of both gravitational waves — the ripples in the fabric of space itself — and electromagnetic radiation of many different kinds. It is as if astronomers who, for millennia, have been watching the skies with the light coming from different objects suddenly got a new sense to look into the universe, combining sight and sound. The results of this newfound clarity promise new untold marvels. The gravitational wave signal was, by itself, revolutionary, as a pair of L-shaped antennas in the U.S. from the LIGO experiment joined a sister experiment called Virgo in Italy to form a kind of observation triangle. This new arrangement allows for a much more precise location of the event, enabling astronomers to quickly turn their different kinds of telescopes to the right spot in the sky. A worldwide coordination effort involving more than 70 teams and thousands of researchers took place in seconds, as telescopes big and small, on land and in space, search for the afterglow of the stellar collision. Energy was released violently into space in the form of gravitational waves, matter, and different kinds of electromagnetic radiation: visible light, radio waves, infrared, x-rays, and gamma rays. Two gamma-ray telescopes locked into the signal 1.7 seconds after the gravitational-wave detectors, confirming that neutron-star collisions are a strong source of extra-galactic gamma rays. But the truly remarkable discovery, confirming what astrophysicists had predicted years back, is that such violent impacts, which eject something close to 2 percent of the stars' mass at high speeds, produce loads of chemical elements heavier than iron, including gold, platinum, and heavy radioactive atoms. The collision creates a dense disk of protons and neutrons that circle the remains of the stars; the particles quickly combine into heavy atoms as the cloud grows and cools. Astronomy will never be the same again. We will be able to watch extremely violent processes on the fly, and watch them in many different ways, as they run their course. When the first optical signals of the neutron star merger were detected, the fireball of ultra-hot gas was as large as the orbit of Neptune, glowing at 8,000 degrees, and radiating about 200 million times more energy than the sun. These are the most spectacular fireworks you can find in the universe. That so many astronomers could each catch a piece of the story and then work together to patch it together is a magnificent achievement. Everytime a new tool or technique made its way into astronomy, amazing new discoveries followed. We are now watching the skies with unprecedented precision and breadth, combining all wavelengths of light with gravitational waves. If history is a guide, we can expect untold surprises as we dramatically amplify our grasp on physical reality. Stay tuned and enjoy the show.